Through the natural course of aging, and due to genetic factors, many people notice puffiness, excess fat and dark circles around the eyes. This may cause you to look more tired or older than you may actually be. 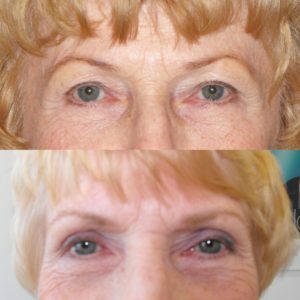 An eyelid lift, or Blepharoplasty, can improve the appearance of your eyes, making you look refreshed and more youthful. Eyelid surgery can be performed on either the upper or lower lids, or combined upper and lower. Small incisions are made on the eyelid to remove excess fat and tissue. Incisions are made to ensure that there is no visible scarring. For the upper lid, the incision is made within the natural fold of the eyelid. For the lower lid, it is made just below the lash line. In some cases, incisions can be extended to improve the excess skin beside the eyes. Excess fat and skin are removed and the muscles surrounding the eye are tightened. Following the procedure, you will be required to ice the eyes for a week to minimize swelling and bruising. Some people experience dryness and blurred vision for several days. Others, for a short period of time, experience excessive tearing and sensitivity to light and wind. Most people are able to return to their usual activities, including wearing contact lenses, in about two weeks. In the lower eyelids, it is common that during the postoperative healing phase, the lower eyelid pulls down and changes the shape of your eye. This is temporary, and usually worst at 48 hours after your surgery. Complete rest at home andfrequent ice packs on the eyes in the first five days is very helpful in minimizing this and reducing long term bruising.